The Chinese CBA regular season restarted on Thursday after its two-week break. 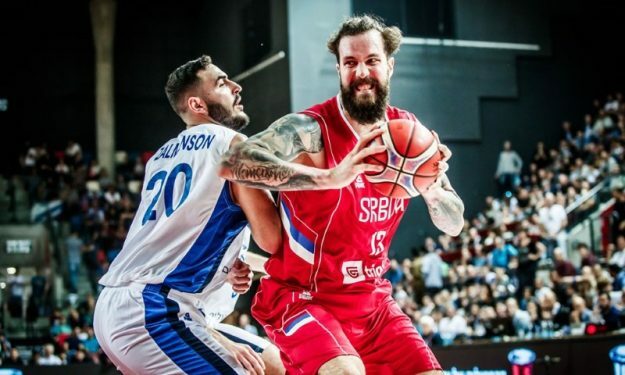 After returning from his trip for Serbia’s FIBA World Cup Qualifiers, Miroslav Raduljica helped the Jiangsu Dragons (7-9) beat the Sichuan Blue Whales (3-13) 112-107. He poured 24 points, also gathered five rebounds, dished two assists and blocked two shots. Donatas Motiejunas had a monster game with 28 points, 20 rebounds, two assists and two blocks but his Shandong Golden Stars (9-7) fell apart in the last quarter and suffered a 107-104 loss to the Beijing Fly Dragons (4-12). Polish International Maciej Lampe poured 23 points, also grabbed 11 boards and dished three assists in 40 minutes. However, his Jilin Northeast Tigers (6-9) suffered a 117-110 home defeat to the Qingdao Eagles (5-11). Greek Giannis Bourousis posted 20 points, seven rebounds, two assists, a steal and a block for the Zhejiang Lions (13-2) that overpowered the Zhejiang Golden Bulls (8-8) with a 104-99 victory. Naturalized Montenegrin Taylor Rochestie finished up with 30 points, 12 assists and four rebounds in the Tianjin Gold Lions’ (2-14) 114-109 loss to the Fujian Sturgeons (9-7). The undefeated Guangdong Southern Tigers (16-0) easily beat the Shanghai Sharks (11-5) 138-101. In other Round 16 action, the Shenzhen Leopards (11-5) got a 114-97 away win over the Bayi Rockets (3-13).